Mix the oats and flour in a bowl. Rub in the lard or butter, then add the salt and enough cold water to form a soft dough. Roll out the dough thinly on a flour dusted work surface. Cut out circles with a 6cm (2½ in) straight-sided cutter. This should make about 20 in total. Beat together the egg and milk to form a glaze. Place a batch of the oatcakes in a large frying pan at a medium heat. Immediately brush the tops of the oatcakes in the pan with glaze – it will turn to a shiny coating as they cook. Cook for about 20 minutes turning after about 15min. They can also be baked with the tops glazed in the oven for 12-14 minutes at 180˚C (350°F/Gas mark 4). Preheat the oven to 200˚C (400˚F/Gas mark 6). Remove all the plastic wrapping from the cheese and replace it in the bottom of its wooden box after lining it with parchment paper. Using a small sharp knife make small slashes all over the top of the cheese. Push one of garlic slices into each cut, followed by a thyme sprig and then add a small teaspoon of the crab apple jelly and grind over with black pepper. Bake for 20 minutes until the cheese has slightly melted. 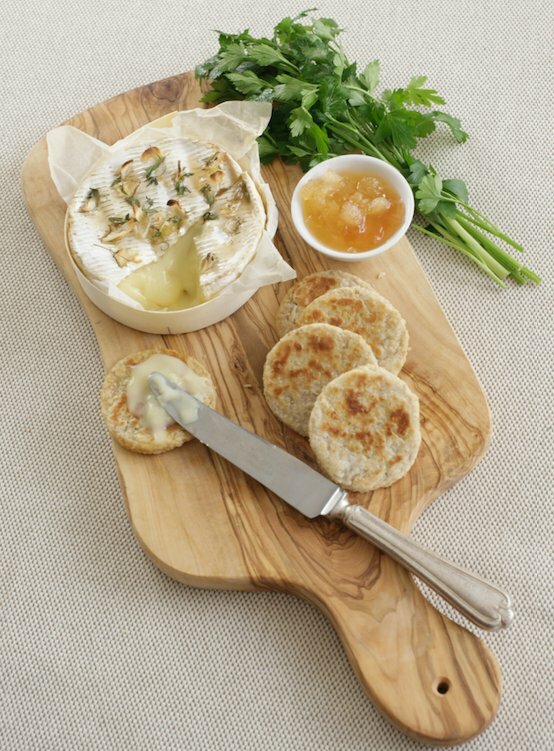 Serve with the oatcakes and crab apple jelly. Previous PostPrevious Greek yoghurt covered in Rowse Honey, strawberries, dark choc and granola.